It's a busy Sunday of stakes racing with Aqueduct, Santa Anita and Tampa Bay Downs carding a total of 10 races worth at least $100,000 in prize-money. Tampa Bay is the hotspot with six big money races. While Tampa gets the bulk of the action, Santa Anita showcases the lone Graded Stakes race. The 14th running of the San Simeon Stakes. The inaugural running was won by TSIGANE for a $75,000 purse when the race was named the Daytona Handicap. In 2009, the Daytona Handicap was elevated to its current standing as a Grade III race. In 2011, it was renamed the Daytona Stakes and changed one-more-time to the San Simeon Stakes in 2016, which was the last time the race was held. After a hiatus and Santa Anita's recent racing suspension, they are back at it this Sunday in Arcadia, California. Seven, three-years-old and up will race 6.5 furlongs on Santa Anita's downhill turf course for the San Simeon Stakes crown. Oddsmakers believe CONQUEST TSUNAMI (PP:1) is the horse to beat. The seven-year-old is a commanding 4/5 morning-line favorite and gets to ride the 18% winning rail. Jockey Drayden Van Dyke is in TSUNAMI's saddle for the second time, following a dominant, wire-to-wire, 4 1/4 lengths win in his last race on January 27, 2019. The Peter Miller trainee has never finished out-of-the-money at the distance with three wins, two seconds and two thirds, including three on Santa Anita's downhill course. The quirky, downhill, sidewinding race favors early speed types like CONQUEST TSUNAMI. Front runners have won 28 of the 47 races at the distance during the current, disrupted meet. The average winner is in second place at the 1/4 and 1/2 mile markers. In addition to early speed, post position appeared to play a part in determining the winner in these downhill, twisty-turny races. 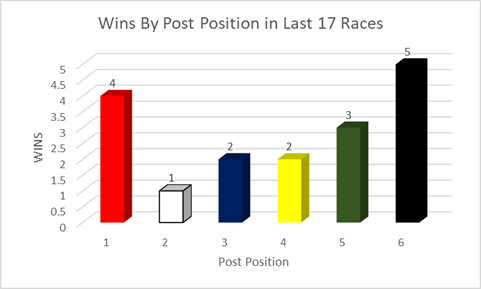 The last 17 races at the distance/surface were won in barbell like fashion with the rail winning four races, the six taking home five and the five-hole scoring three times. That's 12 of 17 or 70.5%. Now that's an edge. Looking at today's field, MESUT (PP: 5 ML 12-1) has never taken to the lead early in his 10 career starts. He's closed and finished no more than 1 3/4 lengths behind the winner in his last six races at today's distance/surface. He could be a factor late. Number six, AIR VICE MARSHALL (ML - 10-1) has shown speed when racing on turf but has not raced at this level. Trainer Doug O'Neill only wins Graded Stakes at 9%. His early step and post position help, but he'll need to prove he can race up, against better competition. The way our handicapper sees it in our Pro Subscribers' Bonus Commentary, CONQUEST TSUNAMI's competition will come from somewhere else other than the five or six silks. "CONQUEST TSUNAMI has never finished out of the money at the distance with three wins, two seconds and two thirds in seven races. LA SARDANE should find the shorter distance to her liking as front runner. CISTRON's trainer John Sadler wins Graded Stakes races a 18% and CISTRON has five seconds in seven races at the distance. ARMS RUNNER won her last race and trainer Peter Miller goes back-to-back at 24%." Make sure you get all of today's Stakes selections. Typically, our picks have performed well at Aqueduct, Santa Anita and Tampa Bay. You can see all our past performance history here.